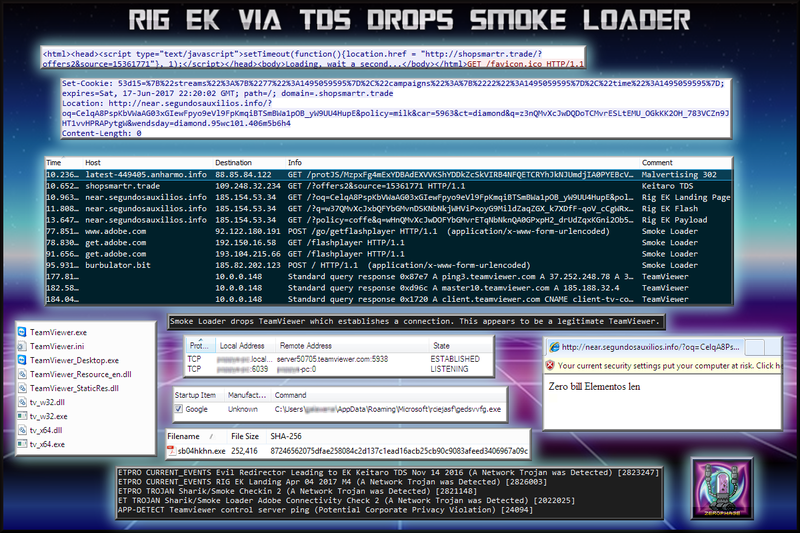 Rig EK via TDS drops Smoke Loader, leads to TeamViewer. This decoy site was serving Philadelphia ransomware the day before. I found it again through a malvertising chain and now believe it was served by Keitaro TDS. 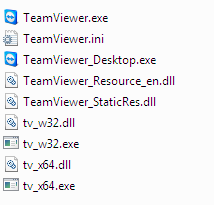 This time it dropped Smoke Loader which downloaded and installed TeamViewer. This appeared to be a legitimate version or at least it did not trigger any AV alerts on VirusTotal. I saw an established connection but did not notice anything odd with my host. Unlike other times I have seen Smoke Loader, there was only this payload. A malvertising chain (possible Keitaro TDS) leads to a 302 to Rig EK. The Rig Landing Page is hosted on IP 185.154.53.34. The landing page displayed the text “Zero bill Elementos len” in the browser. The file established connection to TeamViewer servers though I did not see anyone messing about on my host. I left it running for around an hour and nothing else was dropped by SmokeLoader.